Welcome to the Landhotel Mehrin! The country hotel is located in the midst of a spacious complex with large sun terraces, lawns, a barbecue hut, pool, beach volleyball court and a pond. 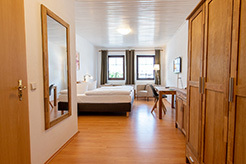 Our rooms and apartments are modern and bright, of course equipped with TV and telephone. For the time being we have a double room with a waterbed of the Pacific. Ask at the time of booking! We also have a wireless hotspot installed so you can use the internet with your laptop or similar. The facility is built largely barrier-free (but not handicapped accessible to DIN), if you have any questions please contact us! Using the module on the left, you can book online rooms with us. Please note that online can only be booked 3 months in advance. If you want to book for a longer period of time, please do so by phone or email. The apartment and the wooden house please book by phone or email. Since we do not always put all quotas online, please call us if the booking does not work out. The single rooms are located in the east wing of the complex. They are bright and comfortably furnished and equipped with shower / WC, satellite TV, telephone and Wi-Fi. 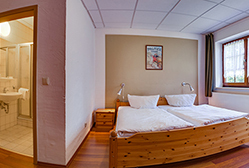 The double rooms are located in the main building. They are bright and comfortably furnished and equipped with shower / WC, satellite TV, telephone and Wi-Fi. In the apartments you will find a living room and a bedroom. Additionally, they are equipped with a kitchenette and fridge. Our sauna is located in the hotel park next to the barbecue area. 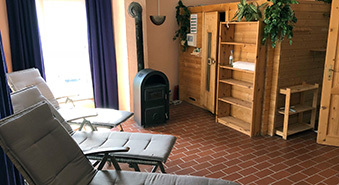 Here our guests can take a sauna and then (in the summer) to cool off in the outdoor pool directly at the sauna. The keys are available by appointment at the reception. The outdoor pool can be found next to the sauna house. Here you can refresh yourself on warm days and sunbathe. For the whirlpool, we have set up a privacy-protected area. Our guests can book the pool by the hour. During this time you have sauna house and whirlpool for yourself. Please note that the pool can only be used without textile, otherwise the water spoils.